CD review: "And Winter Came"
Almost as generically seasonal as holiday-specific, the latest holiday release from the Irish superstar is closer to the sort of Solstice collection Windham Hill tends to issue than it is to most Christmas music. Dreamy and atmospheric, both classical and of no time at all, "And Winter Came" has the feel of Christmas in Tolkien's Middle Earth. 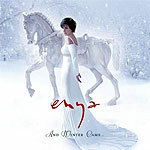 "White Is the Winter Night" and "Trains and Winter Rains" are the most typically Enya songs here, with pizzicato figures dancing atop the melody. "Journey of the Angels" is almost hymnal (and is most definitely about the coming of Jesus), and her take on "O Come, O Come, Emmanuel" is performed as a high Mass hymn. Enya plays every instrument and provides all the vocals. If she has a tendency to over-arrange, over-play and over-produce, she compensates for an awful lot with that angelic voice of hers.